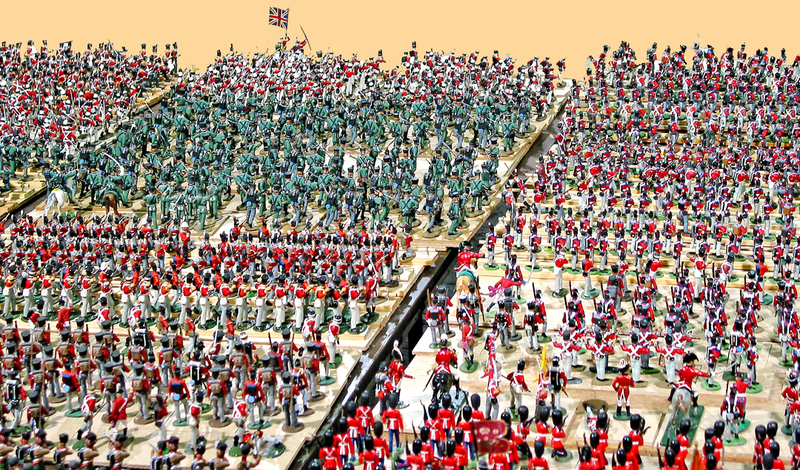 In Part I of this post, which is adapted from an article which appeared in a 2011 issue of Toy Soldier and Model Figure magazine (copyright James Delson), I gave an overview of William Britain’s Deetail plastic toy soldiers and accessories. 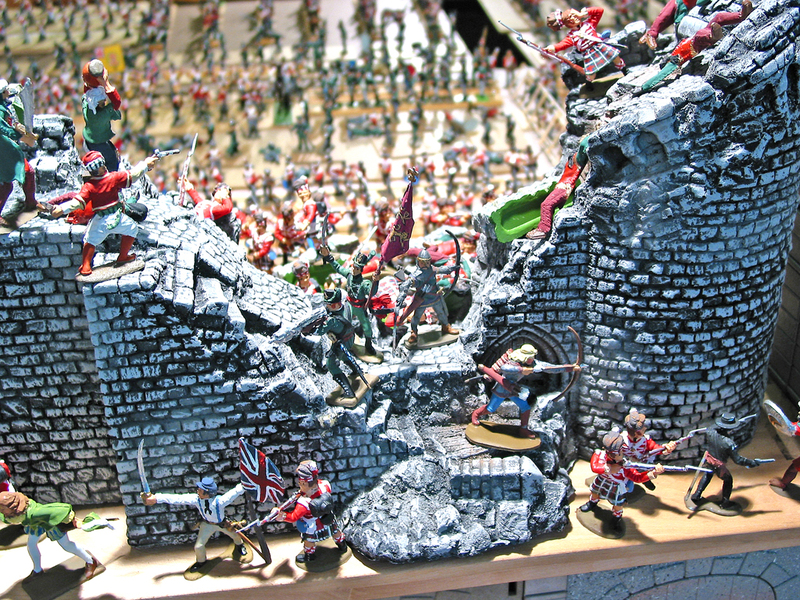 In Part II, I offer advice on how to acquire retired Britains Deetail figures, wargaming ideas, and display tips. If you choose to begin collecting older sets, all of which are long out of production, you’re unlikely to find them in toy stores. For retired sets there are, basically, four routes to follow. First, there’s eBay, the on-line international market place for all things to all people. 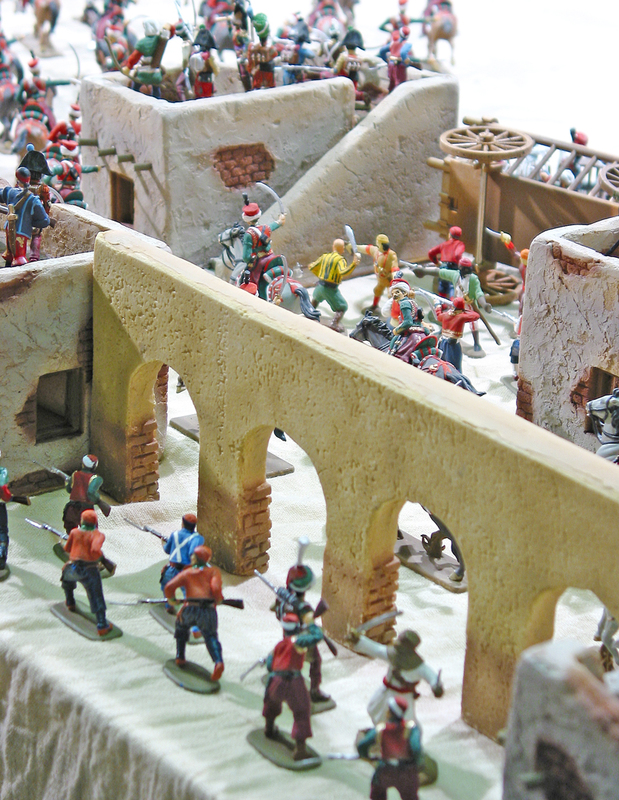 Second, you can buy from dealers of vintage plastics, on line or from catalogs (yes, I run The Toy Soldier Company, and am a dealer of vintage plastic toy soldiers). Third is to buy at toy soldier shows. Fourth, you can buy from auction houses. 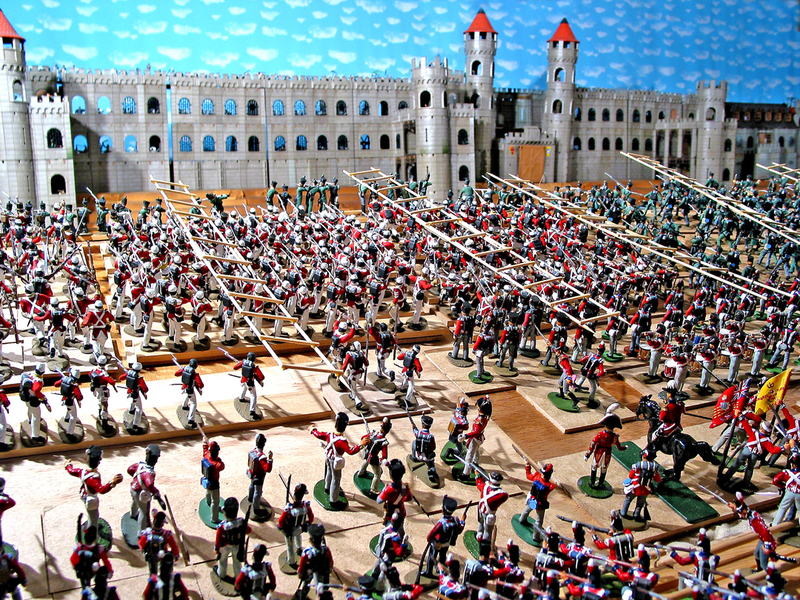 In order to buy using eBay, from an on-line dealer or from a traditional auction house (Vectis Auctions Ltd, in England, offers regular sales of toy soldiers), you need access to a computer, common sense and careful attention. The trick is to know what you’re looking for and to decide in advance what you are willing to pay. This may require months of research to see how much figures actually sell for, depending on condition, rarity and the completeness of the set(s) you are seeking. As an example, Britains originally made two sets of World War II Germans. 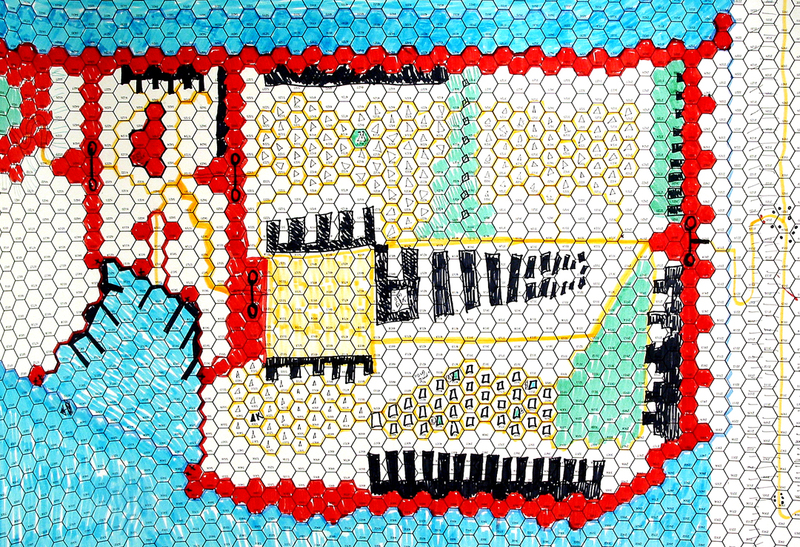 The version in the photo above was produced in 1976 and remained in production through the mid-90s. 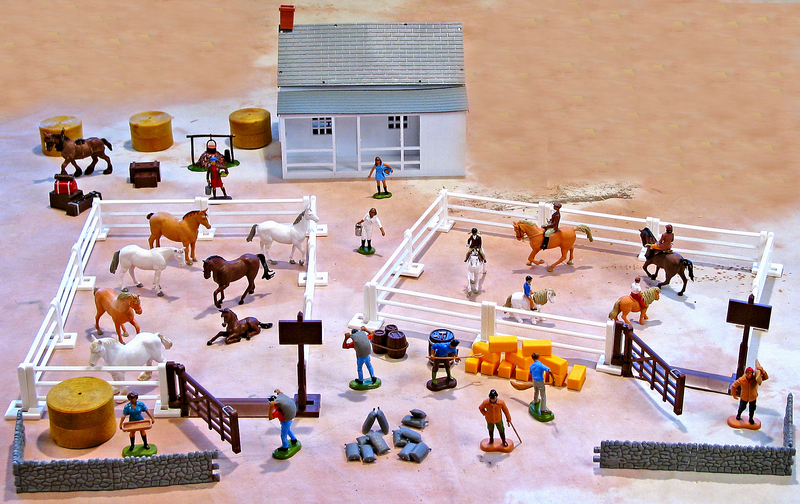 The second set, shown below, was released in 1977 and also remained in production through the mid-90s. 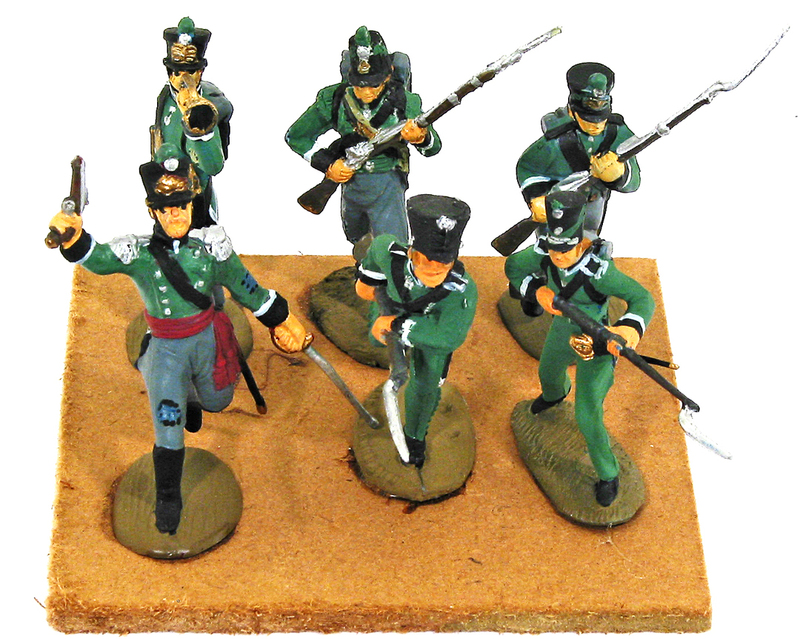 The difficulty for a collector is that the models in both sets wear the same uniforms, are painted in the same style, and have the same helmet decals. One can only differentiate between the sets by knowing the poses, as most dealers and auction sites sell them in mixed lots, rather than in their proper groupings. My best advice is to visit eBay and auction sites often, keeping a written record of the items you are watching. For the first few months, write down the sets you are following, their condition and the final prices achieved. You will begin to see a pattern of which sets are most popular (and which may thus achieve higher prices), which sets are listed less frequently and which sets are shown mint-in-box if that’s your choice. One thing you will find when buying old Deetail figures through any of the routes listed here is that very few sets, except the boxed ones, are ever offered in complete form. Few dealers or auction house employees can accurately identify what Britains Deetail figures they are selling in terms of production year, set number and whether the figures they have grouped together were actually made in the same year, much less in the same set. In the photo above I have assembled a mismatched set. 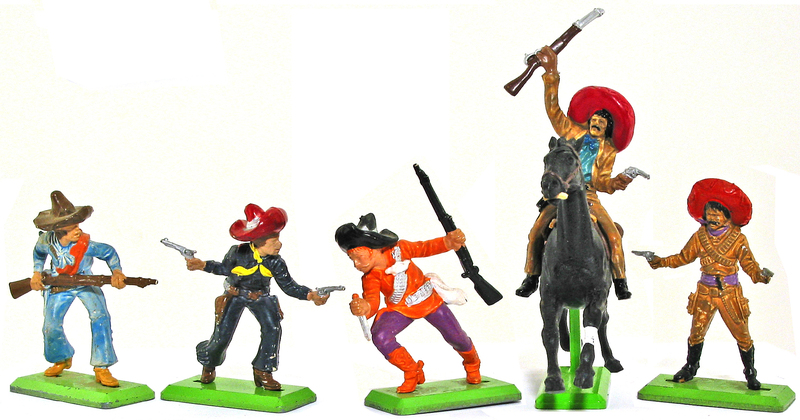 This shot contains (reading from left) 1 fully painted figure from the 1st version dismounted Mexicans (1977), 2 more traditional “Deetail-style” painted Mexicans from the 2nd version (1978), and then 1 mounted Cowboy and 1 dismounted Cowboy from the 1st version of their respective series’ (1972). When buying from dealers and auction houses do your research unless you don’t mind buying mixed lots. With few exceptions, Deetail figures made in any given year share the same style of paint job. 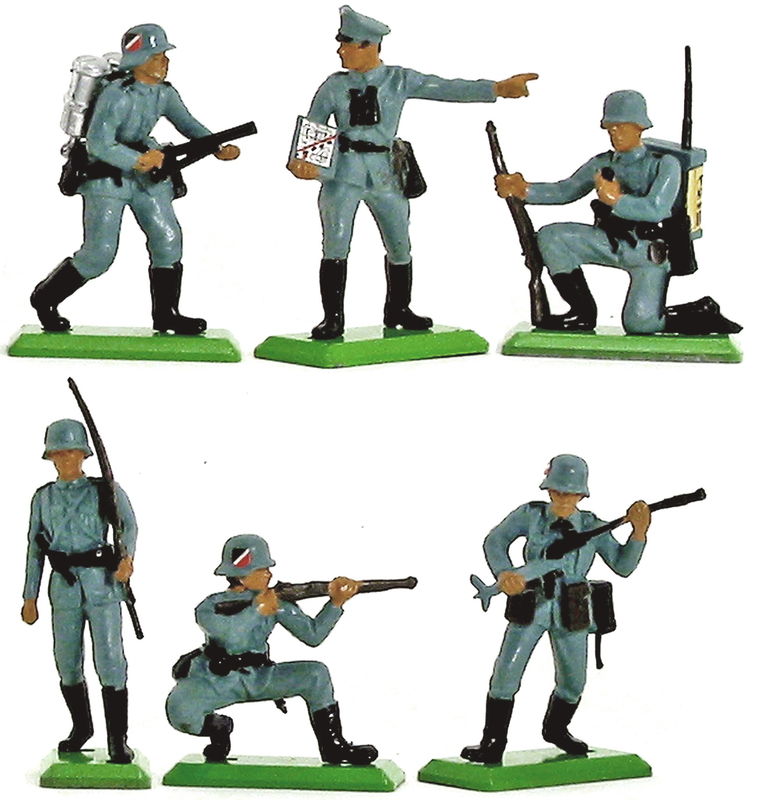 Thus one can tell an early cowboy, WWII Japanese or WWII British infantryman made in 1971, from a later version because it is fully painted, while later versions were not. 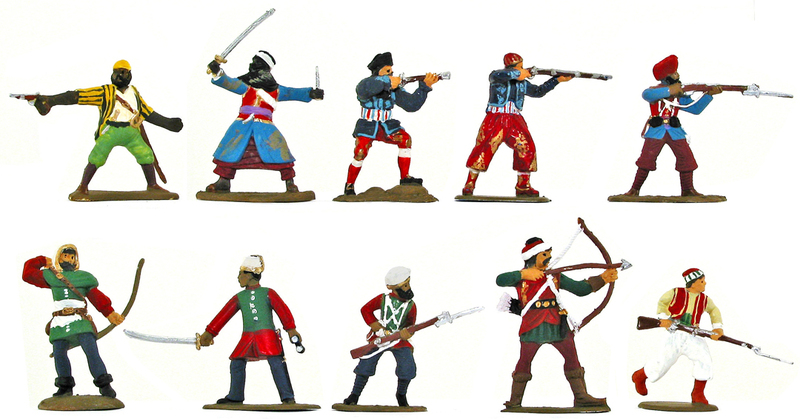 But some paint jobs of the same figures in a set of six also changed dramatically from year to year. Further, ALL Deetail rectangular bases are dated 1971. This is NOT the year the sets you are looking at were probably made (as many dealers and auction houses incorrectly attest), but just the copyright on the base. If you are serious about collecting, it’s up to you to determine the authenticity of a set before buying it. 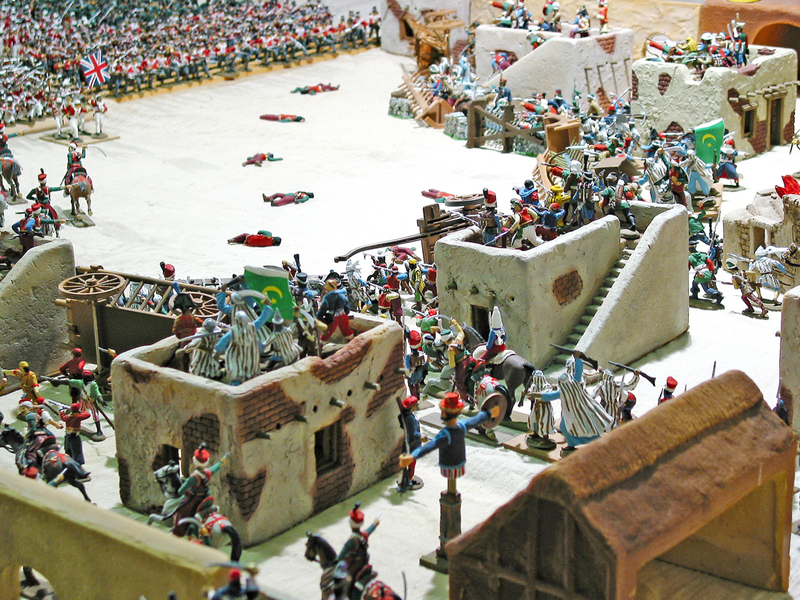 Although the selection is decidedly hit and miss at shows, there are often dealers who bring a selection of Deetail figures and boxed sets to set out on their tables. The danger here is more for the uninitiated than the experienced collector, as many dealers have no idea what determines a complete set, which versions they are offering, whether the weapons are correct, if the figures have been repainted and, most of all, what they are worth. But the virtue of being able to actually examine the goods before making the purchase, and for some, the joy of haggling, are worth the price of admission. The key, as always, is to know what you are looking for, and have some idea of what the merchandise is worth, before going to the show. There are definite advantages to displaying plastics that you don’t get with metals. 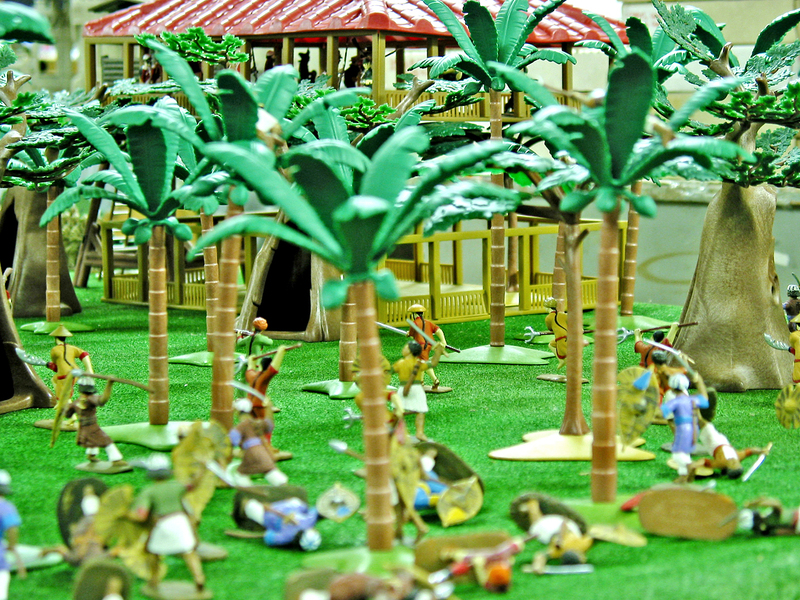 Because they’re far less breakable, they can be displayed in areas that would be considered unsafe with metal figures. Because they’re generally painted with more durable paints, if they get dusty they can be washed in hot soapy water. 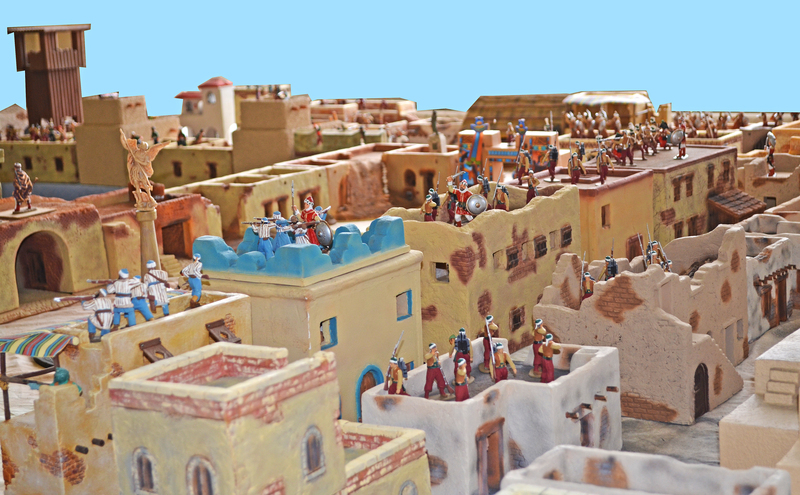 And, because the accessories which go with them are so easily obtainable, you can generally find a selection of items to add to a setup such as buildings, vehicles, entrenchments and artillery. 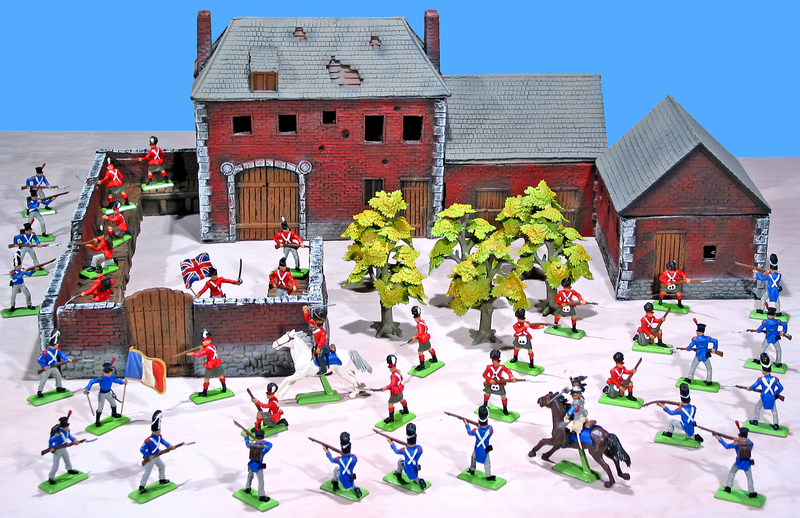 In the Napoleonic diorama shown above, one could arrange the modular Classic Toy Soldier’s Hougoumont farmhouse building as shown, or in a more elongated manner on a bookshelf. 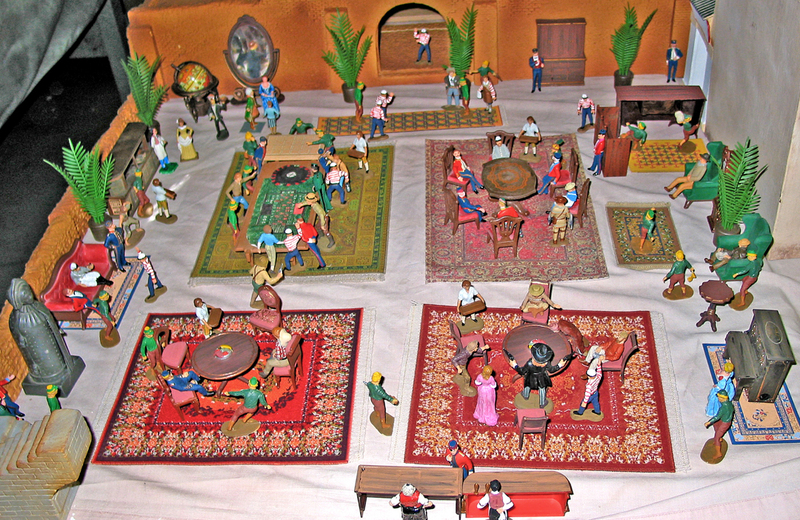 While many plastic collectors seem content to keep their figures piled in a shoebox, only to take them out after dinner and set them up on the dining table for a couple of hours, others are more interested getting down on the floor and playing – either by themselves, with friends or with their children or grandkids. Some of the most popular ranges Britains produced were their farm, wildlife and equine lines. Most of the figures and accessories in these lines strictly qualify as Herald models, having made their debuts before the advent of Deetail. But they remained in production through 2003. Shown above are setups featuring these charming ranges. When Britains released their Medieval Deetail range in 1973, I was excited to find they had created opponents for their knights. 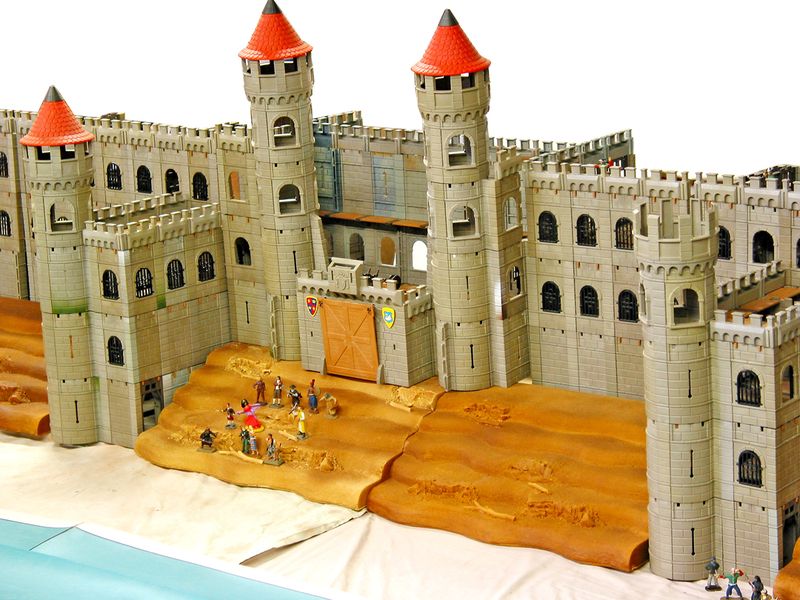 As the years sped by they added more sets to this era until it became the broadest of all Deetail ranges, offering figures, castles, siege equipment, jousting lists, tents and other period-specific toys. 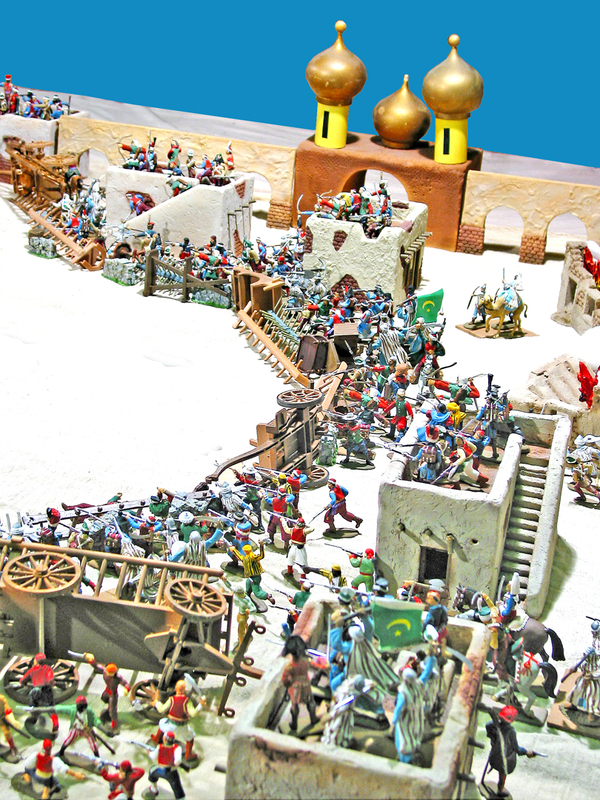 In my war games I have always used large numbers of Deetail Medieval models for Saracen regiments, European knightly entourages and other Medieval levies. 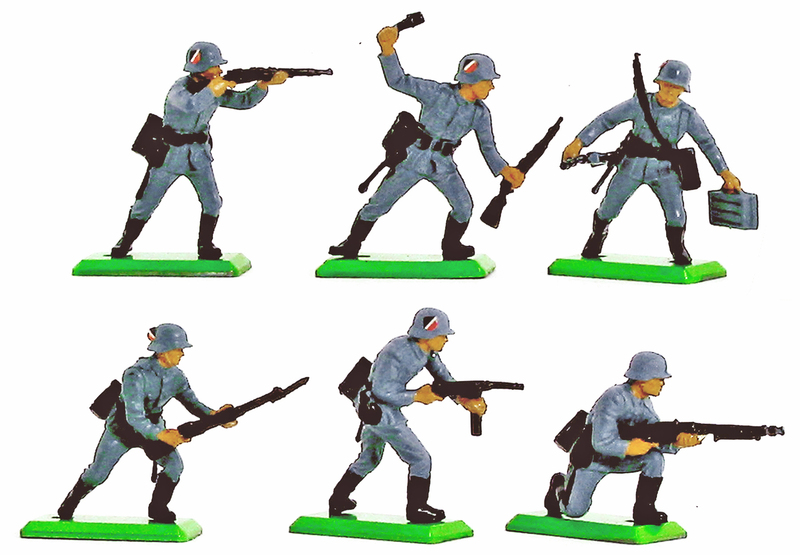 In addition, by repainting and/or converting Deetail figures I have produced hundreds of additional poses for added realism and excitement on the battlefield. 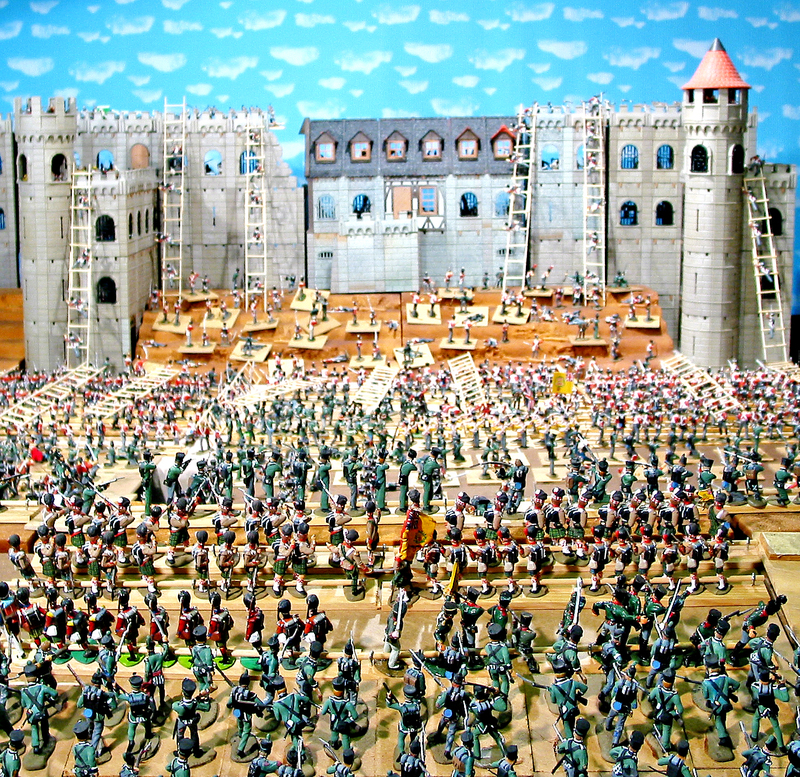 In the photo above, showing the climax of the battle of Agincourt, I have combined several different versions of Deetail knights. At left is the king from the 1st version Knights (#7740, 1973) and 3rd version archers (also #7740, but made in 1993). On the right are foot Knights from 3 different ranges (7740, 3rd version Knights 1993; 7770g current fully painted Super Deetail 5th version; and #7805 Champion Knights, 1993). 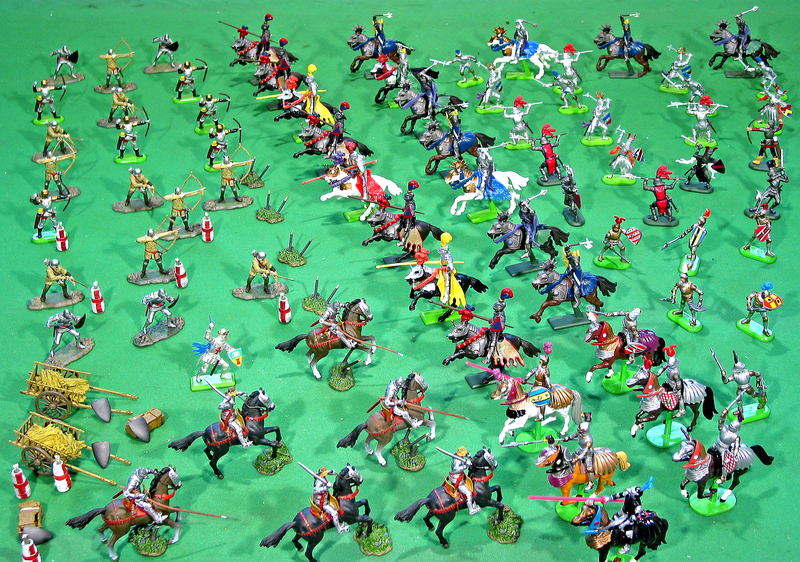 Mounted knights on the right are, likewise, from 3 ranges (7744, 3rd version Knights, 1993; 7772g current fully painted Super Deetail 5th version Mounted Knights; #7806 Mounted Champion Knights, 1993). Also included in the game setup are foot and mounted knights, plus accessories, from Forces of Valor’s “Historical Legends” range. 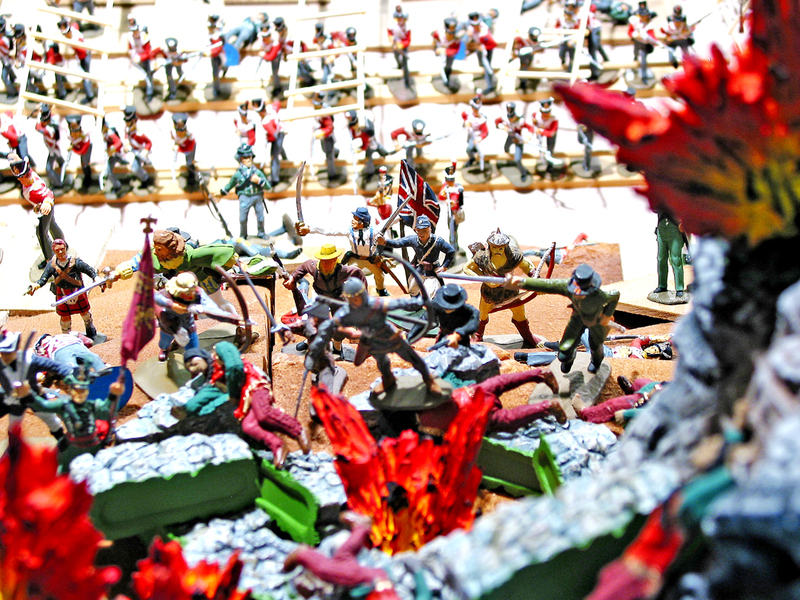 My final photo, shown above, features a carefully-selected group of figures and accessories combined to create a massive Civil War setup. 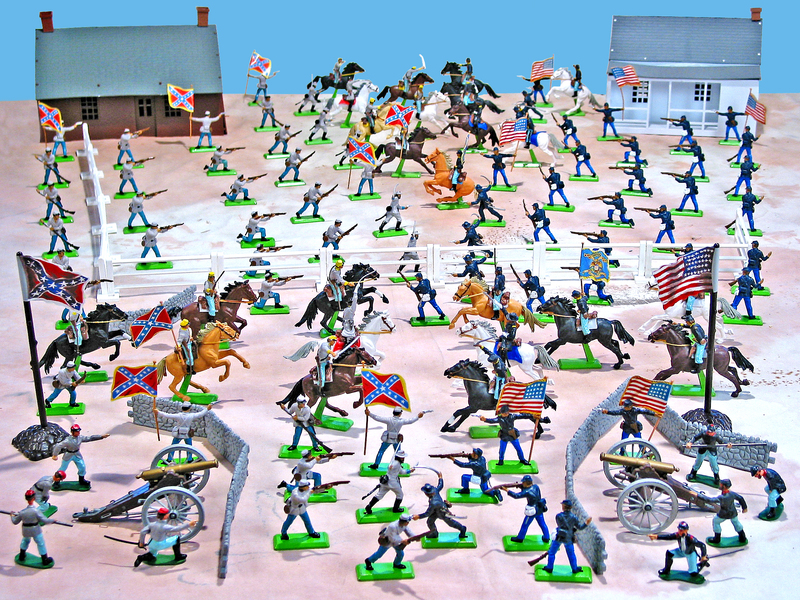 It includes 3rd version Deetail Civil War Union and Confederate infantry and cavalry, 1993, Deetail Union and Confederate Gatling guns (#7570 and #7470, 1977), Britains farm fence, stone walls, small hay bales, round hay bales and small accessories, plus buildings by BMC, trees, dead trees, rocks and hills by Marx and cannon by Dulcop. The reason I was able to create such a massive, yet cohesive, image, is that I assembled the setup from carefully chosen elements of my collection. And this, I believe, is because I approached the building of this collection with an organized and well-thought-out plan. 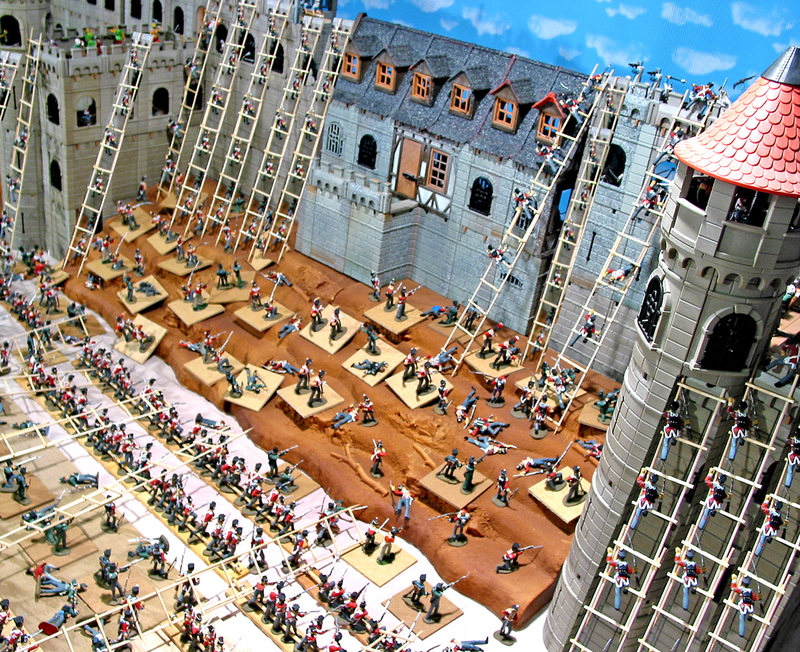 I knew I would be playing games with my figures, so I always sought a balance between what I just WANTED and what I felt I really needed to play large-scale games. Instead of purchasing figures on a whim, and ending up with a bunch of guys who are mis-matched and don’t really look like they belong together on the shelf, ask yourself what sets you really want. 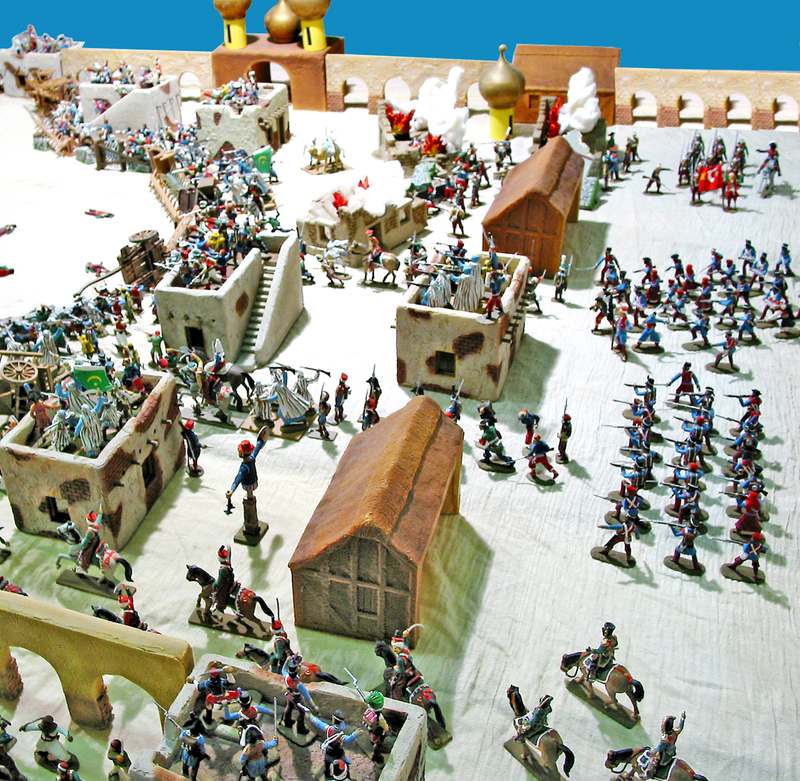 While the main attack was going in against the landward wall of the town, a smaller force was assigned the task of making a diversion against the town’s harbor. 120 small and medium ship’s boats took part, carrying 3 regiments of British, American and British East India Company Marines and about 100 heroes. 840 sailors from the fleet were at the oars. 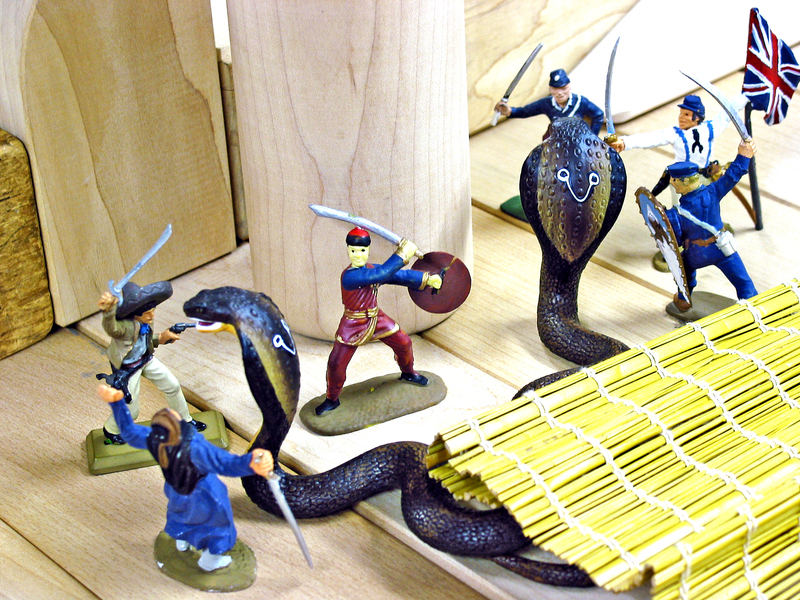 Their job was to ferry the troops to shore, then return to the fleet. John Monteith, Armand van Ingen, David Dougherty, Charlie Elsden and I played a map game of the approach of the boats to shore. Using a collection of boats from the Milton Bradley “Broadsides” game, we laid out a formation of 30 cutters (each holding 12 sailors, 24 Marines and a hero), 60 jolly boats (each holding 6 sailors, 12 Marines and a hero) and 30 small gigs (each holding 4 sailors, 4 Marines and a hero) on 2 large tables. 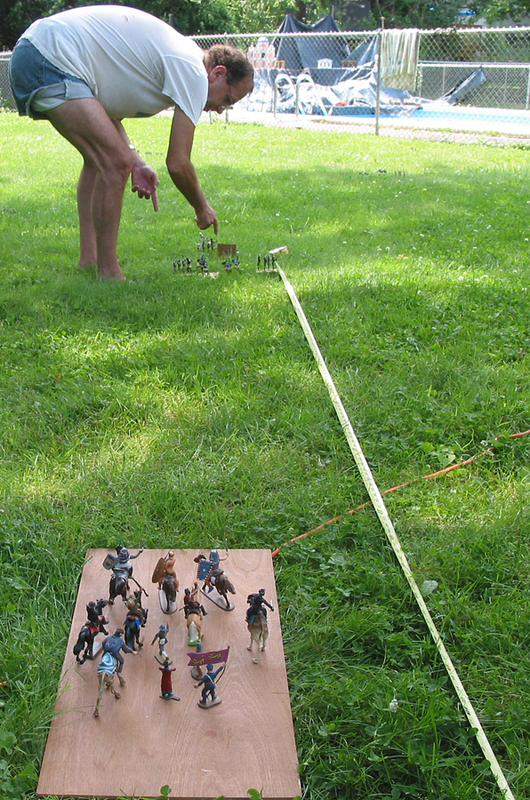 As the flotilla moved towards shore, Charlie, playing the defenders, rolled dice to determine hits against the boats. He did remarkably well against the small craft, sinking all but one of the cutters and about a third of the others, but his marksmanship was unlucky on the followup shots to determine casualties. Though over half of the assaulting force was left swimming in the harbor, barely 5% were removed as dead or hors de combat. 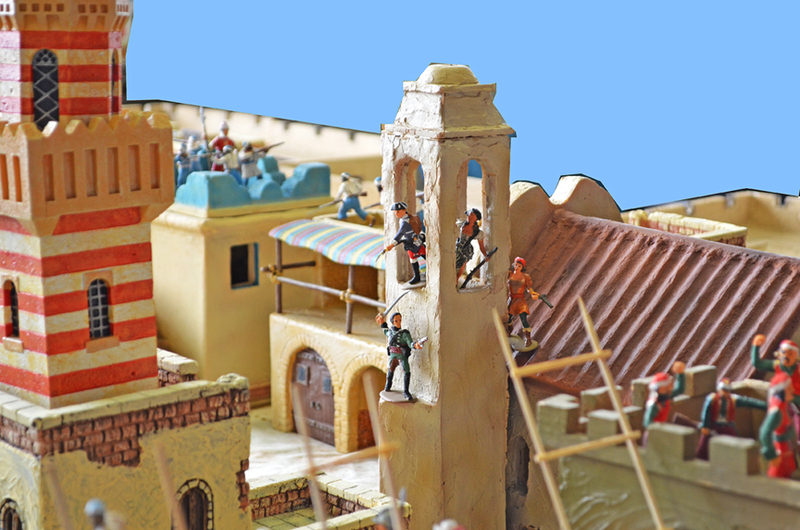 The photos accompanying this narrative show several views of our force touching shore and beginning to fight our way to the top of the outward-facing sea wall and the city’s harbor defenses. More will follow as we fight our way into the town. 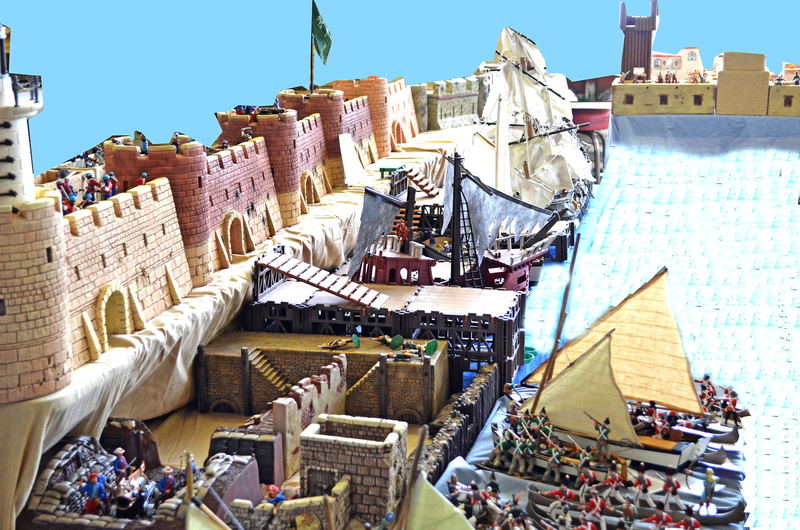 This shot is of our boats just touching ashore below the town’s sea wall (the home-made fort). 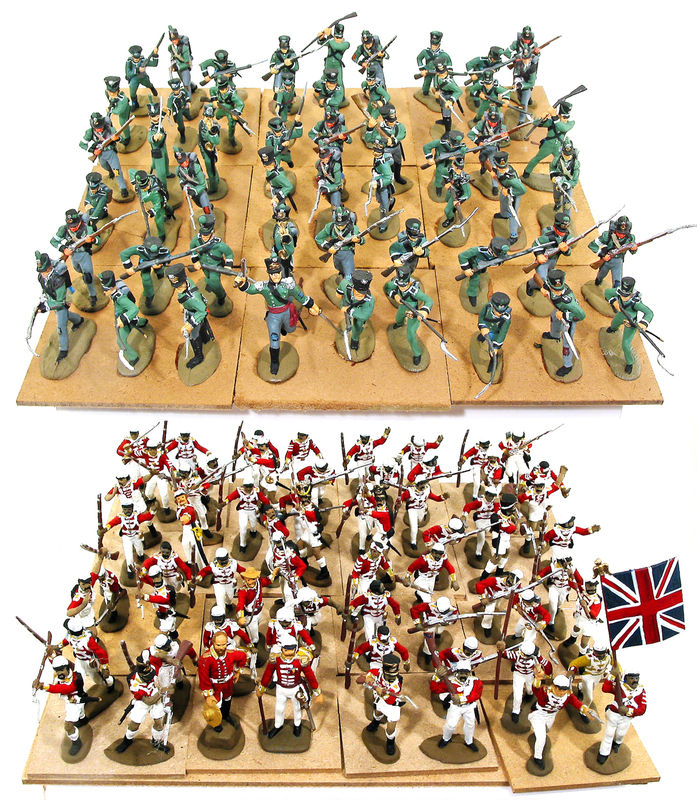 British, American and British East India Company Marines by Barzso, Accurate, Replicants, Armies in Plastic, Hat, Timpo and others. 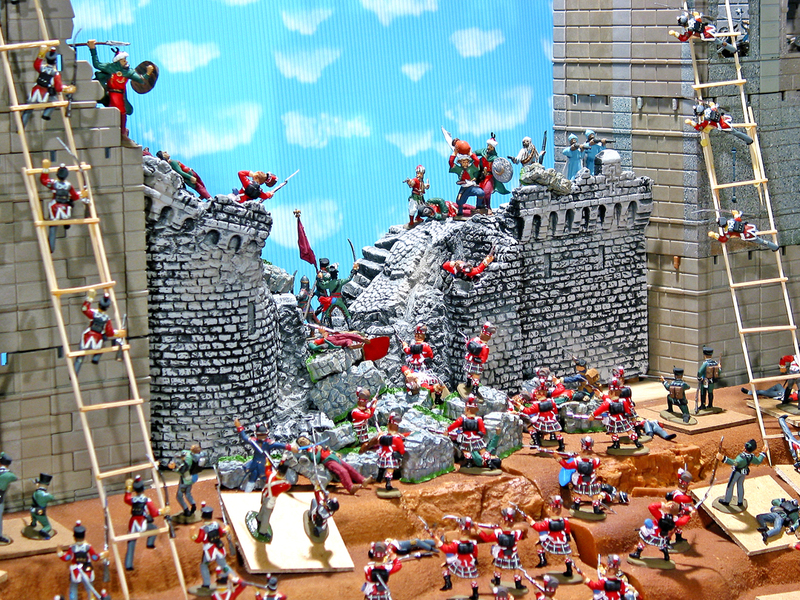 Many hand-animated Marines and Harold’s Rangers characters. 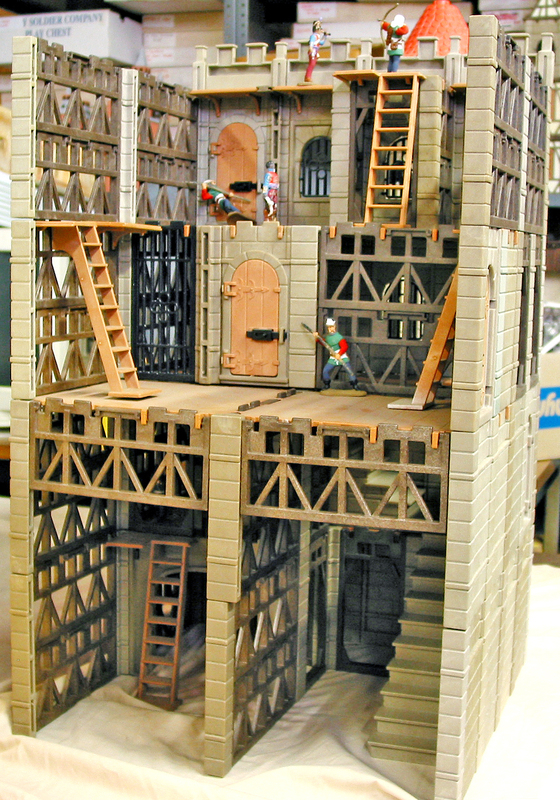 We raised pre-fabricated ladders and assaulted the walls. The fighting was tough, and we took casualties as the defenders were shooting down at us and throwing numerous grenades. But a lucky shot by one of the Rangers hit one of the enemy grenadiers in the hand. He dropped his grenade, killing himself and several others. One of the others was another grenadier, who dropped his grenade, killing himself and several of his comrades. As luck would have it, one of them was also throwing a grenade, so he, too dropped his, blowing himself and others up. 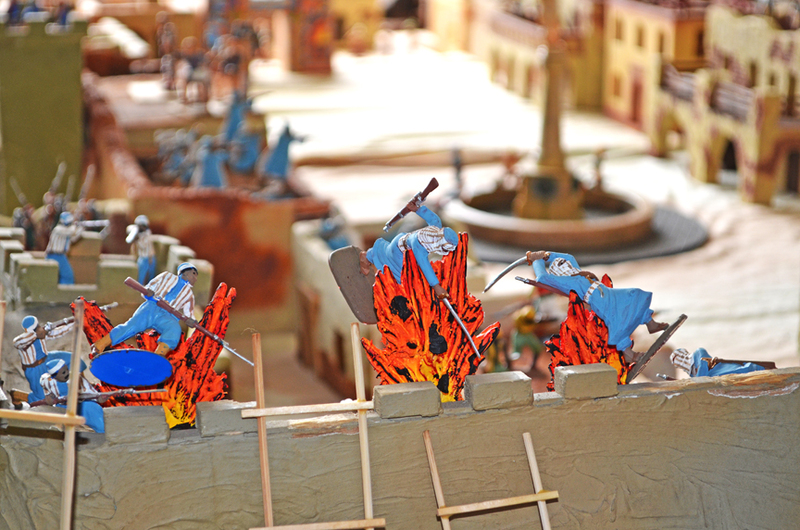 This ripple effect, which had never happened in one of our games before (in over 40 years of playing Harold’s Rangers) cleared the whole western corner of the wall, allowing the attackers to climb up and use this position as a staging area for the next wave of the attack. Welcome to the Harold’s Rangers blog. 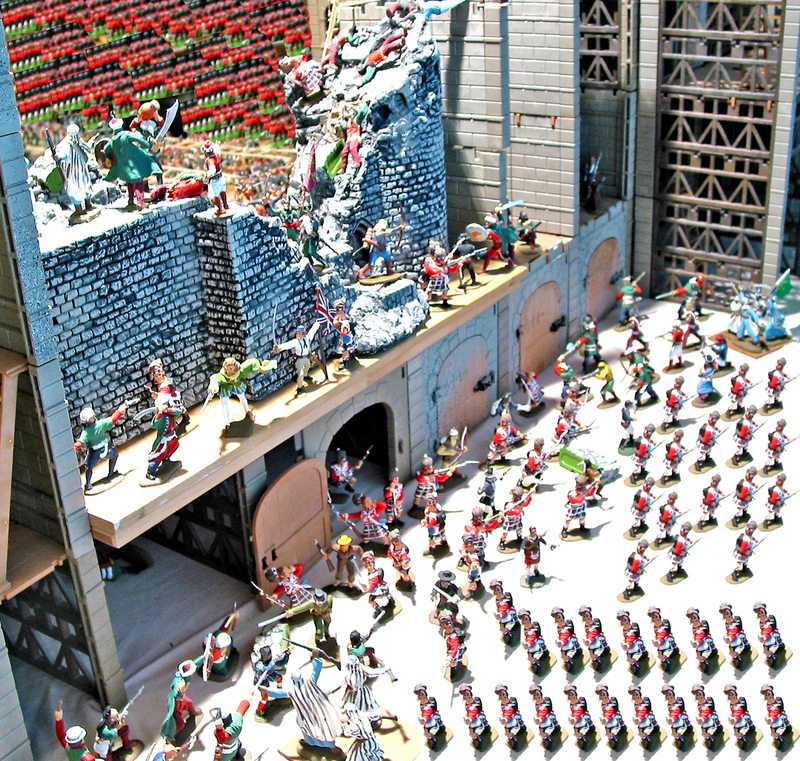 I’m Jamie Delson, a life-long toy soldier collector and wargamer. My brother, Eric, introduced me to Avalon Hill board games, such as “Tactics II” and “Gettysburg”, when I was in grade school back in the 1950s. 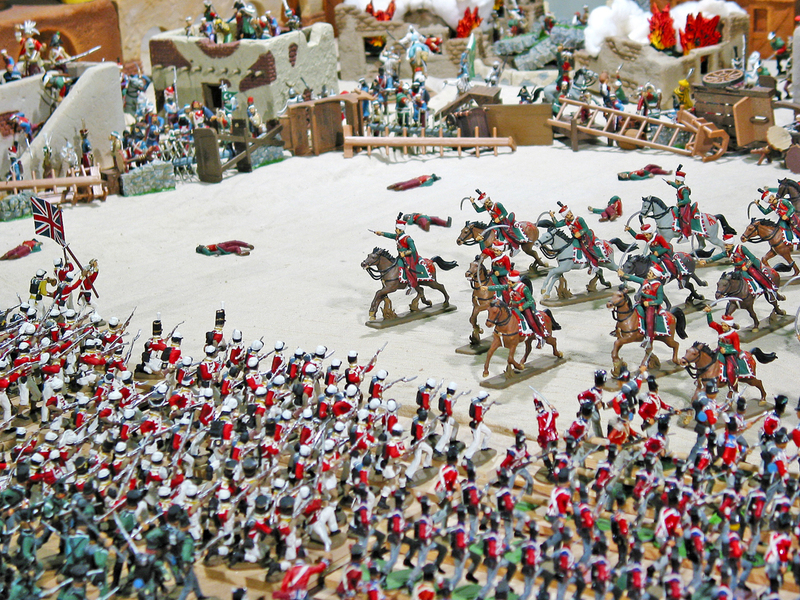 Up to that time I had been satisfied with setting up huge battles with 54mm toy soldiers on my floor. 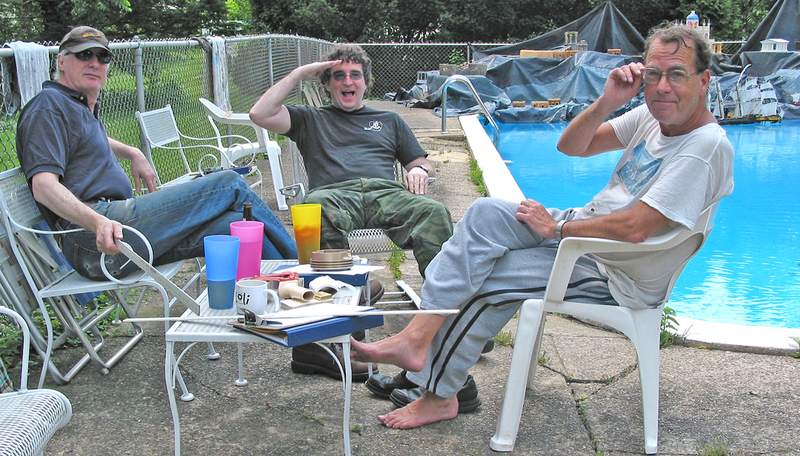 But playing the board games with Eric influenced me to stop throwing golf balls, darts and pencils at my soldiers in favor of trying to find a set of rules which would allow me to use soldiers, instead of cardboard counters, to play out games with my toys. Over the next two decades I tried out rule sets by H.G. Wells, Donald Featherstone, Joseph Morschauser and the team of Brigadier Peter Young and Lt. Col. J.P. Lawford. 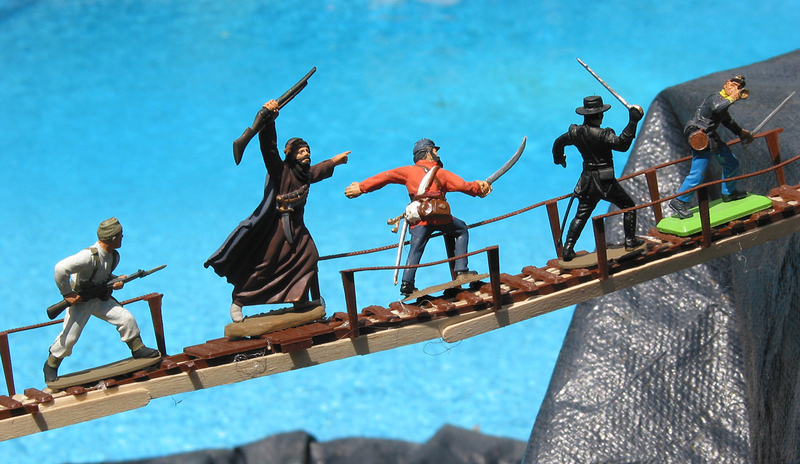 Influenced by their works, I wrote my own set of rules for 54mm figures, which continued to be developed as they were played and replayed through high school, college and adulthood. But it wasn’t until the 1980s, when I met Armand van Ingen and John Monteith, that the full rules of “Harold’s Rangers” were developed. Since then, I, along with Monteith, van Ingen and David Dougherty, plus scores of fellow hobbyists, have been playing an ongoing series of games. I titled the game “Harold’s Rangers” after the ill-fated English King, Harold Godwinson, who is the leader of my own forces. 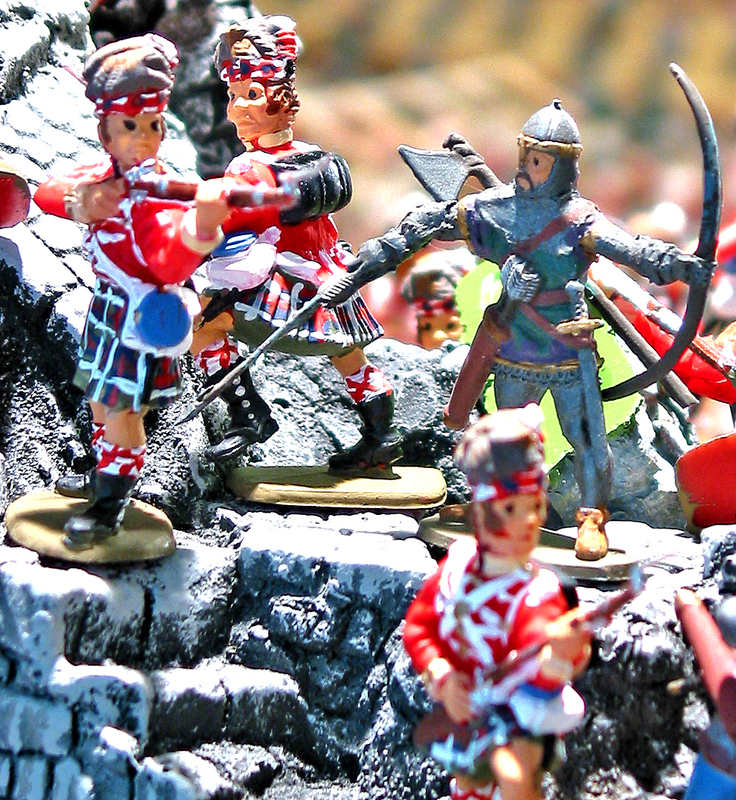 He, and many other characters in the game, such as John Nicholson, are real historical figures, but our armies also include fictional characters such as Richard Sharpe, Sergeant Harper and Suzie the Samurai. 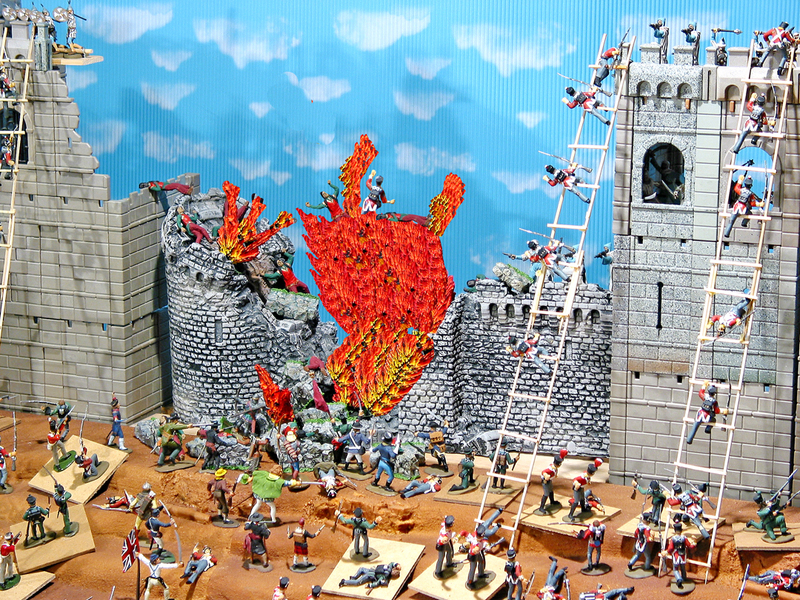 This blog offers me a chance to share the saga of our 30-year gaming history. “Harold’s Rangers” is as much a series of stories, or movies, as a game. Each time we play we add a new chapter which can be viewed and re-viewed in the many photos we have taken of every game, and I and my friends hope to recount our adventures for your enjoyment. 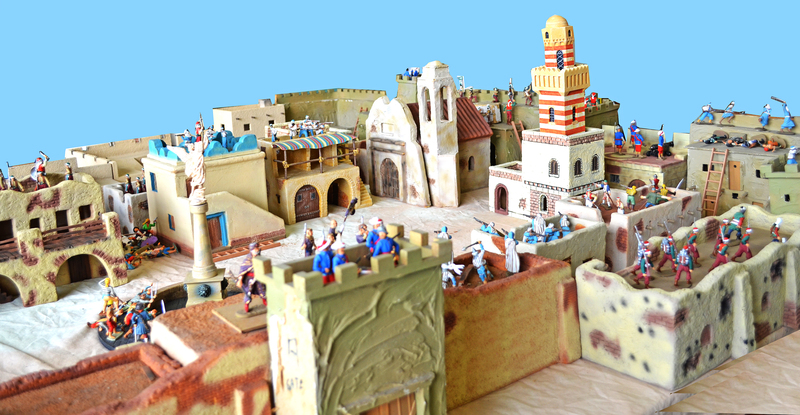 By wandering the site, you will also find articles I have written about the hobby, practical advice and how-to documents on painting, animating and collecting, and much more. 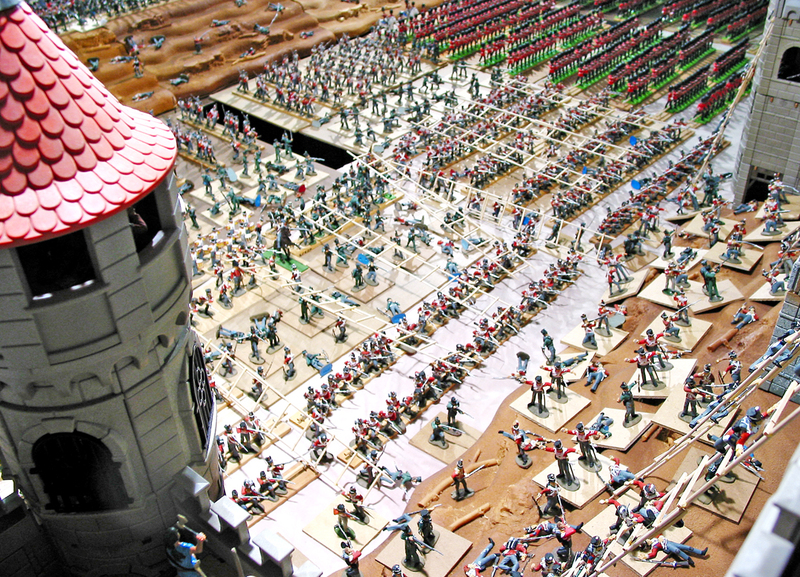 My day job is running The Toy Soldier Company with my wife, Jenny. 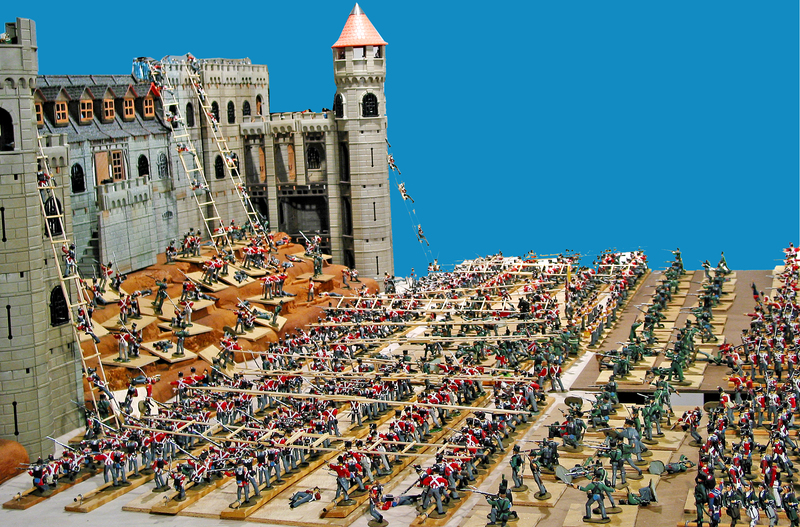 We sell plastic and metal toy soldiers, in scales from HO to 70mm, through our website and print catalogs. My aim is keep the focus of this blog on fun, not work, but as the two are inextricably linked in my life I will apologize if commerce rears its ugly head from time to time. I have been a professional writer, of screenplays and newspaper and magazine articles, for 40 years. But this format is new to me, so please bear with me as I feel my way through this new adventure. I welcome your comments and look forward to sharing my passion for this hobby with you.